Arrive Dhaka Airport, On arrival meeting and transfer to hotel. After refreshment start for Dhaka city sightseeing. Sadarghat waterfront, the Ahsan Manjil (Pink Palace). After visiting the Star Mosque and Dhakeswari Temple, enjoy lunch in a Bangladeshi restaurant. Then visit New Market, the National Museum and Parliament building. Founded in 1608 as the seat of the imperial Mughal viceroys of Bengal. Known to the world for centuries for its fine silk and Muslin. 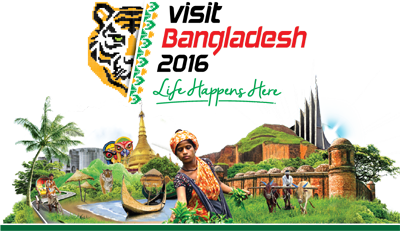 As the capital of Bangladesh it has grown into a busy city of trades, business, cultural and sport activities. Having a happy blending of the old and new architectural trends, Dhaka has been developing fast as a modern city since the independence of Bangladesh in 1971, have dinner Overnight at hotel. After early breakfast start visit National Martyrs Memorial is situated in Nabinagar, Savar approximately 35 km from Dhaka. The memorial designed by architect Moinul Hossain is dedicated to the sacred memory of the millions of unknown martyrs of the war of liberation. This Martyrs Memorial is a symbol of Bengali nationalism. It is really a scenic beauty of 108 acre of land. The top of this monument is 150 ft. high, which consists other 07 triangular monuments. Its open 07 days a week besides this monument, have lunch in Parjatan restaurant opposite of memorial gate, after lunch return back Dhaka free for shopping, overnight at Dhaka. Morning leave Dhaka for Chittagong. 5 h 11 min (243.9 km)En route visit old Panam Nagar buildings were constructed during 19th century and famous Grand Trunk Road was built during 16th century and Sonargaon village about 29 km from Dhaka was one of the oldest capital of Bengal as well as the capital of independent Sultanate of Bengal during 13th century. Also visit old Buddhist ruins at Mainamoti in Comilla about 96 km from Dhaka City, Comilla was the seat of a Buddhist civilization that flourished from 7th to 12 Century AD. At about 8 km west of Comilla Town as many as fifty spots have been marked of which some have been dug out from under the soil of a range of low hills known as Mainamati - Lalmai Ridge. The excavations of Shalban Vihara, Vasu Vihara, Ananda Vihara, Kotila Mura, Charpatra Mura, Itakhola Mura and Rupban Mura have immense archeological and cultural importance especially in the field of studies of Buddhism. There is also a museum with a collection of historical artifacts found at the excavation sites. A visit to the World War II Cemetery at Mainamati where the bodies of 753 soldiers of the allied forces along with the bodies of some Japanese soldiers are lying in unforgettable. The Saptadasha Ratna Temple ( 17-towered temple built in the 17th century by Maharaja Ratnamanikya II of Tripura) located at outskirts of Comilla Town, is also worth seeing. Continue drive to Chittagong. CHITTAGONG: about 268 km from Dhaka by road and 35 minutes by air is Chittagong, the second largest city of Bangladesh and a busy sea-port. The green hill forests and the sea beaches have made Chittagong a good spot for the holiday-makers. Chittagong was described by the famous Chinese traveler Yuan Chuang (7th century AD) as a sleeping beauty emerging from the mist and water and has been given the nickname "PORTO GRANDE" by the 16th century Portuguese seafarers.Late afternoon arrival Chittagong and transfer to hotel. After breakfast visit chittagong city natural lake (Foaij Lake) a walk thru hilly path lunch have Chittagong, including the Ethnological Museum and Shrine of legendary Sufi holy man Bayzid Bostami.patenga sea beach. temple, a small manmade lake market 08:00 hours. In the evening return to hotel and free for rest, then dinner will served. Overnight at hotel. After breakfast at 07:00 am drive to Cox’s Bazaar 5 h 28 min (190.5 km) journey, Cox’s Bazar Check in hotel have lunch, take rest around 01:00 hours Start Visit Sea beach enjoy Sun set Come Back Hotel. Overnight at hotel. Early in the morning after breakfast visit the fish market and see the fishing boats delivering their catches, Enjoy the beach. After lunch, visit the Buddhist temple and monastery. In afternoon have a beach drive to Himchari.In the evening visit, a local craft market called 'Burmese Market 08:00 hours. Overnight at hotel. After breakfast leave Cox's Bazar for St. Martin Island , 1 h 41 min (55.9 km)full day sightseeing St. Martin Island have dinner and culture program on beach overnight. After breakfast after sightseeing mornig visit chera deep, after lunch leave St. Martin Island by ship arrive Teknaf evening and immediately transfer Bus for Dhaka, 9 h 58 min (442.8 km)nights journey early in the morning arrive Dhaka transfer hotel. have breakfast, this day have rest, after lunch free for shopping, at evening have dinner at hotel restaurant overnight. After breakfast if time permit has shopping after that transfer to airport as per the flight schedule. All Hotel ac accommodation twin share basis. All travel and transportation by Chartered AC tourist coach. All meals Breakfast, lunch, dinner, Bangladeshi restaurant. Airport - hotel – Airport transfer. Hard drinks, Personal Tips, Laundry Charge, Telephone, Fax, Internet etc. (1) Flash light. (2) Snicker shoes for walking. (3) Hat/Cap for Sun protection. (4) Sun-burn lotion & insects spray. (5) Binoculars (6) Camera, films & battery (7) Toothpaste & tooth brush (8) Towels (9) Bath soap / Shampoo (10.) Routine medicine. 01. Minimum 50%of the said payment required to book a tour and rest the 50% should be paid before the commencement of the tour. We will be responsible for the operation of the tours as per the itinerary under normal situation. For personal accident, sickness, loss of baggage during the tour, delay or cancellation of Train, any political problem, natural disaster creating unusual situation to conduct a tour, etc. We shall not be directly responsible. We will be responsible to extend all possible assistance in overcoming those problems. In this circumstances guest(s) must pay any extra cost incurred overcome those problems. We reserve the right to withdraw or amend any tour, should the situation warrant such action in our operation, on should such situation a refund of proportionate amount will be made. The Tour operator reserves the right to accept or refuse any participant as a member of a tour package. Special note: Itinerary might be changed by mutual understanding between honorable guest/team leader and guide.